Guests have a choice of 3 onsite restaurants, and can enjoy cocktails at 2 stylish lounges. This luxury hotel also features an outdoor pool, a 9-hole golf course, and an in-house spa. Thistle Port Dickson's 251 accommodations open to balconies overlooking the Strait of Malacca, the tropical gardens, or the golf course. Rooms are equipped with air conditioning and LCD televisions. Set along 36 hectares of tropical gardens, the 4.5-star Thistle Port Dickson is a luxurious yet family-friendly getaway. The resort features its own 2-mile (3-kilometer) private beach, a large outdoor pool with spa tub and Kids' Wet Play Zone, an adults-only infinity pool, and a 9-hole golf course. Guests can enjoy a workout at the fitness center, or indulge in a massage at the in-house Puteri Dewi Spa. Three onsite restaurants include Fresh, featuring an a la carte menu; Chinoise, serving Cantonese and Szechuan fare; and Glass, specializing in Italian dishes. Cumulus, a bar overlooking the beach, serves up tapas and cocktails, and often has live performances. Room service is available 24 hours. 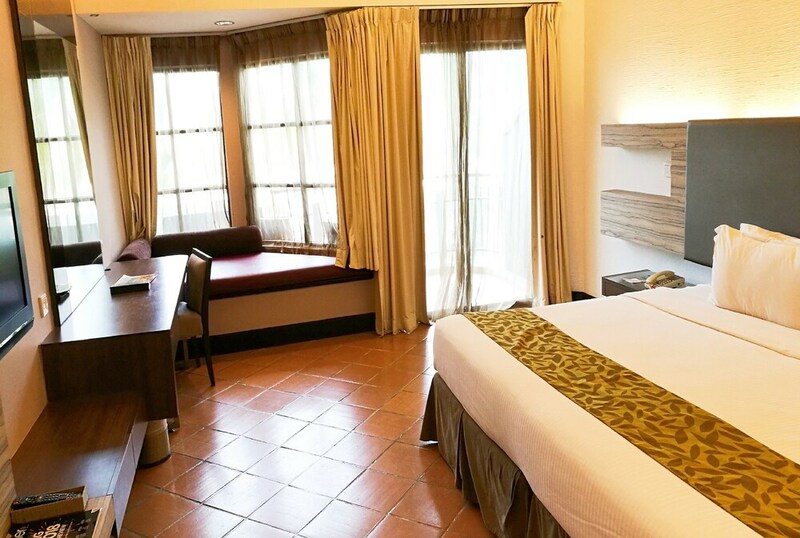 This Port Dickson hotel offers complimentary wireless Internet access in public areas and guestrooms, and free outdoor parking is available. Chinoise - Enjoy views of the swimming pool while surrounded by cultural and contemporary art, creating a classy yet comfortable ambiance. The hotel's highly-skilled master chef creates traditional Cantonese and Szechuan specialties at this fine-dining restaurant. Open for lunch and dinner. Cumulus - This watering hole faces the beach and is right next to the infinity pool, allowing you to sip on cocktails and snack on light fares while taking in the breathtaking sunset views. Fresh - This contemporary café overlooks the pool and boasts a variety of local and international à la carte dishes, while buffets are offered on some weekends. Open for lunch and dinner. Glass - Guests can enjoy an impressive wine list and Italian cuisine at this fine-dining restaurant. Al fresco dining is available. Steps - Read a book, check your emails, or just relax and appreciate the view at the hotel's lobby lounge which features opulent high ceilings, and serves light fare and a variety of beverages. Guests can enjoy a large outdoor pool with a spa tub. An adults-only infinity pool by Cumulus and a 9-hole golf course are available. The fitness center has cardiovascular and weight machines, as well as personal trainers on hand. Children can stay entertained with a kids' club, including arts & crafts and a movie room. The pool area also offers a separate Kids' Wet Play Zone. The recreational activities listed below are available either on site or nearby. The in-house Puteri Dewi Spa offers a range of services, including Swedish massage, traditional Chinese massage, aromatherapy, and reflexology. Airport shuttle service is available on request from 7:30 AM to 11:00 PM. Fees may apply. Contact the property in advance to make arrangements. This property offers transfers from the airport (surcharges may apply). Guests must contact the property with arrival details before travel, using the contact information on the booking confirmation. Reservations are required for golf tee times. Reservations can be made by contacting the hotel prior to arrival, using the contact information on the booking confirmation. The property has connecting/adjoining rooms, which are subject to availability and can be requested by contacting the property using the number on the booking confirmation.